An Innovation from The Elite Meat Company ! It’s our great Peameal Bacon, coated with Peppercorn ! You know our Peameal Bacon. You have helped to establish it as the “Gold Standard”, number one selling brand of Peameal Bacon in Canada’s food service channel. 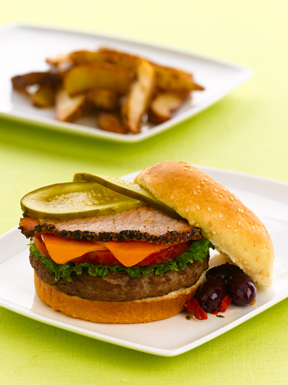 Now, Peppercorn Peameal Bacon takes sandwiches and breakfast to a new level ! This new flavour can expand possibilities and create new appeal, with the fusion of peppercorn and bacon flavour ! Elite Peameal Bacon is gluten free, has the lowest fat and sodium in Canada, the highest in protein, and offers the lowest shrink = lowest food cost. It cooks as fast as the egg or the burger it is complimenting! © 2018 Cardinal Meat Specialists Ltd.